The Eagle GT is Goodyear's Ultra High Performance All-Season tire developed for the drivers of sports cars, coupes and sedans looking for style, handling and all-season capabilities. The Eagle GT is designed to combine an eye-catching tread pattern that delivers in dry and wet conditions, along with all-season versatility, even in light snow. 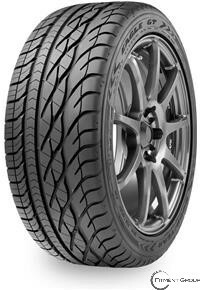 The Eagle GT features an all-season tread compound molded into a dual-zone asymmetric tread design. The outboard high-performance zone features large independent shoulder and intermediate tread blocks to enhance steering response and provide predictable handling, along with sweeping Aquachute tread grooves that help evacuate water to enhance wet traction. The inboard all-season zone features a continuous rib flanked by dual circumferential grooves to help evacuate water and the inboard shoulder blocks feature Tredlock sipes to blend stability on the road with traction in snow. The tire's internal structure includes twin steel belts reinforced by spirally wrapped nylon to combine uniform ride quality with high-speed capability, along with a polyester cord casing.